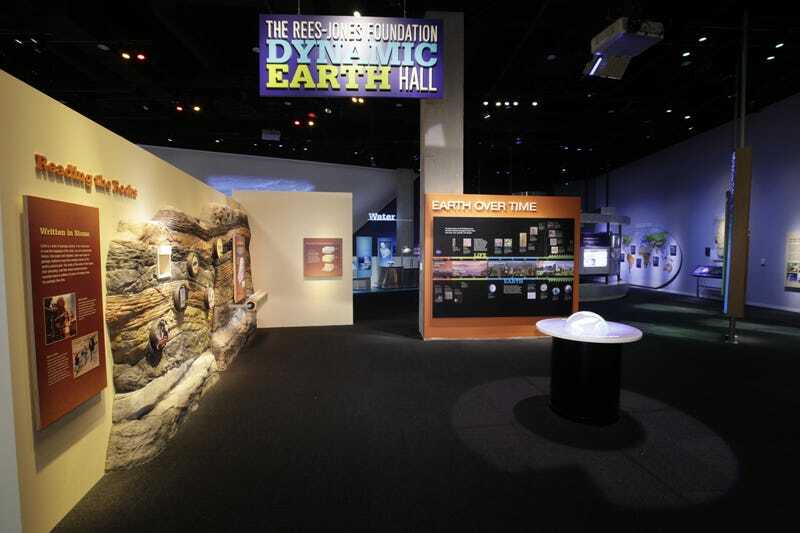 When the $185-million Perot Museum of Nature and Science opened in Dallas, it removed an exhibit describing the link between fossil fuels and climate change. It's just one egregious example of the reluctance of museums across the country to discuss how human activities are altering the climate. The missing panel states that "Volcanic eruptions and burning fossil fuels increase the amount of carbon dioxide and other heat-trapping gases in the atmosphere. This warms the Earth and can cause sea levels to rise and climates to change." A caption below a photo of what looks like a smokestack added: "Humans have altered Earth's climate by burning coal and other fossil fuels that release carbon dioxide." The museum opened in late 2012, but the newspaper only learned about the missing panel earlier this month, when its existence was revealed in an interview with the design firm that had been commissioned to create several of the exhibits. The museum says the panel was incorrectly designed to fit its space, so it was temporarily removed until a new one could be manufactured — which is a reasonable explanation, except that the "temporary removal" has, thus far, lasted a year-and-a-half. Louise Bradshaw, director of education at the St. Louis Zoo, who has given talks about navigating politically controversial subjects, said several museums use a similar tack. "Sometimes when you put the two words [global warming] together, it creates a flash point that gets distracting," she said. "There are other ways to get there without picking a fight." "Science centers are designed to be informative and fun," said Bud Rock, CEO of the Association of Science-Technology Centers. That's one reason why some subjects, like dinosaurs and space, make it into exhibit halls more often than others, including climate change. The Science Museum of Minnesota in St. Paul leavens sobering environmental data with hopeful messages. Its "Future Earth" hall explains that "the planet is changing at a faster rate than anything that's been recorded through the geological record, other than a catastrophic event, like the meteor that took out dinosaurs," said Martin. But instead of presenting it as "this bummer story," he said, the museum frames climate change as a challenge that humans can adapt to with creativity and innovation. Many institutions prefer to insert brief references to global warming in exhibits that focus on other subjects, rather than devoting a single hall to the issue. The Florida Museum of Natural History recently hosted an exhibition about the science of surfing that addressed the effects of sea level rise and coastal erosion on catching a wave. It suggests that the burning of fossil fuels and volcanic eruptions are equally responsible for global warming, when "humans now are emitting 100 times as much carbon dioxide as volcanoes are, so it's not even close," said Andrew Dessler, a climate scientist at Texas A&M University in College Station. He added that many museums stress the climate's natural variability in order to avoid controversy. Natural variability is a factor, but scientists agree that humans bear most of the responsibility for present-day climatic shifts. "My sense is that this is a common approach," Dessler said. "The museums say, 'We can't not talk about humans, but let's try to talk about them as little as possible.'"